We still can't believe we're writing this in March, but the big freeze hit the UK hard! It is essential to make sure you take all the right precautions during these, particularly cold weeks should the snow make a comeback. Not just for you and your families’ health, but also other reasons such as the health of your utility bills to name a few! Especially with the news that this weekend 'the beast from the east' will be hitting us again this weekend (just as we start to recover and get back to normal after Storm Emma!) It seems that this cold weather and its potential dangers will be sticking around for a lot longer than we first expected. This doesn't mean that it's too late to take precautions to keep warm and stay safe, inside and outside your home! In this blog, we're going to take you through our simple and easy tips for keeping warm, including how thermal cameras could become your best asset during these cold temperatures and how it could save you time, money and potential frostbite now and in many years to come. Here are a few tips should the Beast From The East or Storm Emma strike again. The home...The place where we spent A LOT of time... So it's worth making sure keeping you and your family safe and warm! The cold temperatures for the next week or so could highlight areas in your house that you didn't realise are crying out for some attention. Do you still feel the cold even when the windows are shut, the doors are closed, and the heating is on? It might be a sign of internal area in your house that needs investigating into further. This is when your thermal camera can help resolve any problems quickly and safely so you can continue to enjoy warm and cosy evenings curled up on the sofa. The most prominent issues that the cold can bring to light are cracks and draught whether that be in the walls or infrastructure of your house. Not treated or investigated, the problem will often only get progressively worse which leads to either paying more and more in your utility bills or spending much more than you should for your gas and electric! 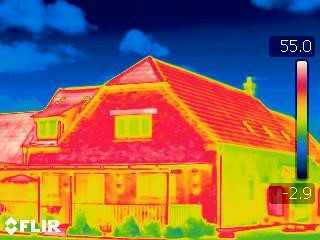 However spending more time, energy on investigating the core of where the problem started by using a thermal camera can show you exactly what you are dealing with and the true extent of the problem which is causing your house not to stay warm. Many people fall into the trap of spending vast amounts of a budget without adequately investigating how big or small the crack or draught is. Your thermal camera can detect precisely where the problem area could be and how big the problem is. Customers who use thermal cameras are often astonished to find out that where they ‘thought' the problem was occurring and where it stems from are two entirely different places! I bet you didn't know that thermal cameras can detect the flu? An interesting fact for you! A few years ago, when swine flu was affecting thousands of people in the UK, airports used thermal cameras to detect people who had the flu virus to prevent them flying and spreading the illness around many people flying! With the average healthy body temperature being typically close to 37 degrees, thermal cameras were able to detect the small increase in unwell passengers body temperature as a way of identifying potential swine flu victims! Investing in quality thermal clothing can help keep you insulated and keep the cold away! If you are having any problems during this cold snap or anytime during the winter months where you feel a thermal camera could help you stay warm and safe, feel free to drop us a line on 01234 219421 and we'll be more than happy to assist.